Excellent. Thank you, Carson. This has to be the most practical and comprehensive pieces I’ve ever read on the subject. Great stuff. A $1000 job? Every 3 days? Seriously? Somebody pays writers that much for 3 days work?… I’ve had only one writing job that paid $300+ per article – that was for a brand name almost everyone knows and the articles were highly creative and technical – I actually had to invent stuff and describe how I did it. Took well over few weeks for each article. Maybe I’m just not that lucky. Do you often land a $1000 job? @Slava – I do not have much experience selling articles. I have certainly not had much luck earning via blogging. I can say, however, that there are many forms of writing that pay well above $1,000 per job. Be patient, but if you are finding article writing is just not lucrative enough, try another market. I think Jeremy doesn’t KNOW where any of those $1000 job are or he WOULD tell you specifics!!!!!!! Jeremy, cowboy up and tell us specifically where you’ve landed a $1000 job and with what company! Best article I’ve read here so far. This take working as a professional writer away from the employee entitlement mentality to business owner mindset. It’s all about the numbers and getting real about what it takes. The simplest techniques are almost always the most effective. Nicely done Carson! I tend to work against a weekly minimum rather than a daily one, but I can see the appeal of the daily number. Recently, I have started setting minimum “community involvement” goals each week also. You can call it networking it you want, but I prefer to think of it as finding ways to give some starter help to other businesses and organizations. This post just helped me figure out how I’m going to make it through this month. /Thank you/. I think this article should be renamed to How to Make a Living as an Accountant. @Nikita, As an accountant, I take exception to that. What he’s describing is just common sense, being responsible for yourself, and a good work ethic. Accounting is much more boring. I’ve used a similar budgeting method for several years successfully. It works well, for me, to do my budget about two weeks ahead of time. So, around Oct. 15th, I’ll be working on November’s budget. This allows me to plan for holidays, birthdays, and other “unexpected” expenses and adjust my workload accordingly. Great tips! I like having something to work towards, and this method will keep me motivated to keep writing, since there’s no room to slack off. I did the calculations and it looks like a pretty reasonable goal. This article appears to be aimed at very beginning freelancers who are doing small projects that generate small sums. In reality, I think the only way you really make a good living as a freelancer is to expand your thinking, develop your skills, and find or develop better opportunities. As I said, I know some people here are doing $50 projects, but most of the freelancers I know who are sustaining careers are doing multi-thousand dollar projects that aren’t finish in one day, and they don’t gauge their work on daily billable income. But I really doubt many freelancers are averaging $7,500 a month over the course of the year is their business plan is to wake up, work until they make $340, and then quit. I have to admit I didn’t like this approach because it seems to be thinking in terms of creating ceilings instead of opportunities. I doubt many people who think in the way this article advises them to will ever make a good living as a writer. Joe, if you’re a beginning freelancer doing small jobs and living in the US this article must be really depressive because it would mean that you have to calculate based on $5-$7/entry posts. Welcome to the real world for most beginners. As network manager and having worked with many freelancers over the last years, I can tell you thought that for many $3500-$4500 a monthly target is. At beginner rates that still converts to 20-30 pieces/day. This method works 100% of the time. This is the method I have been using for years and it is simple math. For many people, the difficult part comes in when you start getting down on yourself because you missed the mark a few days and now you have to realize you need to bust your hump to make it up. Such is the freelance life. It is not like a job where no matter how much work you get done that day, you will still get a paycheck and the work will still be there the next morning. All I know is that it works and the numbers don’t lie. Thanks for the post! Excellent article. I mean, really good stuff. Not only does it affirm that there is still a living to be made as a freelance writer (even seasoned professionals have doubts sometimes, admittedly or not), but you even give a formula for possible success! Very inspirational, and realistically possible. Good job! Okay, this may be just because I’m 17, but how in the world does a freelance writer make 340$ a day? I can’t even fathom making that much off of writing in a day, and I’m considering writing as a career possibility. “or watch re-runs of old sitcoms and marvel at how many technical schools buy ad time on afternoon broadcast television.” ahahahah hilarious! I really value your advice but it seems like the freelance writing market is extremely competitive and its hard to find good paying jobs. Any suggestions on where to look? Hi all, this is not my blog, but I thought I would respond to a few of the comments. @Timothy – $350 a day is not as difficult as you might imagine. High traffic blogs will pay $100-200 per post, but it is increasingly difficult to break into those arenas. In my opinion, the easiest way for young writers to make decent money is to study copywriting. 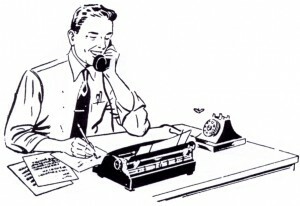 Brochures and news releases for local businesses are a good way to get started, but you have to sell the work directly. @Acacia (wonderful name, btw) – Think local. Think very local. Most new writers loathe selling, so they spend all of their time looking at posted positions online. The truth is, you might have more luck and recurring work from your neighborhood pizza parlor that needs new “specials” menus every month. Am I the only person that does not find any value in this article at all? It is a jumble of advice on juggling numbers. It has nothing to do with developing a freelance writing career. Geez. I gather people don’t like doing corporate gigs. With corporate (including nonprofit) gigs, one can earn that $340 in 4 or 5 hours – or less – booked in chunks of several days or weeks at a time. I occasionally write blog posts as labors of love. I wouldn’t bother trying to make a living out of $100-$200 articles, let alone researched articles or those requiring sources. White papers, case studies, and grant proposals pay five to ten times that much. What do you suggest for a newbie? It sounds like great advice if you have become pro. I’m slowly intergrating into working from home doing VA and some article writting. But to be honest I’m hardly making enough to pay for the simple things such as bread and milk. OY’ hopefully I can make it to the level I can finacially support my family. This is a great system and I use a similar one myself. Having a daily target number helps to keep you on track. As a freelancer it is so easy to get caught up with the non paying part of your job, like commenting on blog posts to build links to your website (see what I did here!) Also, one way to account for some of the money is to look for passive streams of income. Try becoming an affiliate or write a book you can sell on your website. This is a pretty good piece and I sorely needed to hear this. It sounds a LOT like how I approach Nanowrimo: regardless of the day I’m having, I MUST hit at least the minimum number. After that anything goes. On great days, I have more than enough to tide me over in case of bad days. On bad days, hitting the minimum takes pressure off. And if I don’t hit the minimum? It’s something I can fix/work towards.